The cookie cutter properties are the easy ones. But have you ever felt like you were just guessing at the value when dealing with something unique? Or maybe it seemed like you were throwing darts at a dartboard to come up with a number. What do we do when properties are different from the rest of the neighborhood? Let’s kick around some ideas below. I’d love to hear your take in the comments too. Deep Research: If a property is challenging, how far back in time have you looked? Sometimes we say things like, “I’ve scoured everything,” when in fact we’ve only glanced the past 3 to 6 months of sales. If we are dealing with something funky, we might have to look at years worth of sales to find something similar. Finding older similar sales is important because it helps us see how a challenging property fit into the local market. You can thus use older sales for research or include them in a report or CMA (and make an adjustment up or down depending on how the market has moved). Previous Subject Sale: Has the subject property sold before? If so, what did the subject compare to at the time? Finding comps for prior sales might be a clue into how the subject property fits into the context of the market. Of course it’s important to remember the previous sale might have closed too high or low. That One Feature: Often a home might be fairly standard, but what makes it difficult to value is an extra feature that is less common for the neighborhood. Maybe it’s a huge barn, accessory dwelling, or a studio above a garage. This is where we have to try to find something that is similar enough so we can gauge what the market has actually paid for that feature (since the cost of the feature might be way more than the actual value it adds). Remember, we might not be able to find something exactly the same, so we’ll have to be okay with similar, which is alright as long as we are looking at two things that are truly competitive. As an example, we might be able to find four neighborhood sales with accessory dwellings over the past couple of years and then compare those sales with otherwise similar homes (but without an accessory unit). As we start to compare prices, we can try to extract a percentage or dollar amount for what the accessory unit contributed to the overall sale, and then apply that in today’s market. Competitive Areas: If sales are extremely sparse in the subject neighborhood, where else would a buyer consider purchasing? You might try looking there for recent sales. Make sure the neighborhoods really are competitive though, and the way you’ll know that is if prices have been similar over time in both areas. Bottom & Top: Sometimes when dealing with a really funky property, we have to ask ourselves where the top and bottom of the price market is in the neighborhood. At the least this gives us some context for where the value of the subject property is likely to fit (I know, that might be a wide range, but it’s better than nothing). Ask for Advice: One of the best things to do when valuing a tricky property is to ask for advice. Seek out others who have valued something like that before and ask for wisdom. What did you do? Who did you talk to? Where did you go for comps? What challenges did you face? Target Buyer: It’s often useful to consider who a target buyer might be so we can gauge how that representative buyer might approach the property. Range of Value: When a property is out-of-the-ordinary, it’s useful to see value in a range. We like to be so precise about value, but the best thing we can do at times is to give a range of value based on research. Thus instead of saying, “The value is $550,000 exactly”, we might say “A reasonable value range is $530,000 to $560,000”. This can work well for agents to communicate value for a unique home, but it can also work well with appraisers for doing certain types of private appraisals or consulting work where a precise value is not needed (a lender is going to want an appraiser to select a specific value). Test the Market: You can do all your homework on a property and still not be sure the value is where you think it is. Sometimes when a property is unique, it’s good to go in with research or maybe even hire an appraiser, but at some point the property needs to be exposed to the market. After all, the market will tell you what it’s worth. Blogging Class I’m Teaching: I’m teaching a class coming on April 12 at SAR from 9-11am. 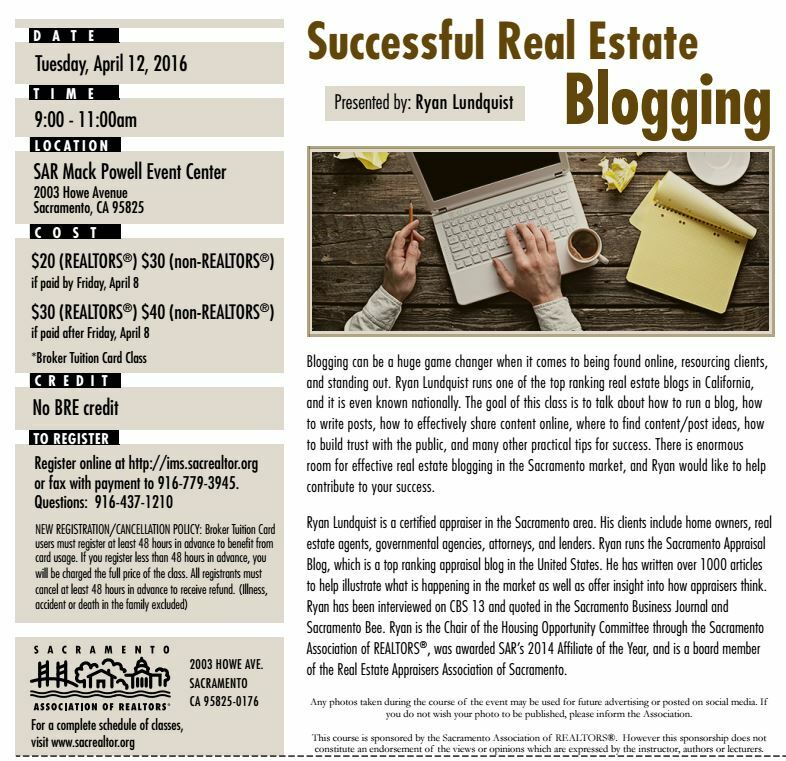 It’s called “Successful Real Estate Blogging“, and I’ll be talking through the nuts and bolts of effective blogging. This will be extremely practical, and my goal is for you to take action (rather than just listen to me talk shop). I’d love for you to be there. See the attached image for more info. Let me know if you have questions. What makes a good “comp” for an appraiser? Are there certain guidelines appraisers have to follow when choosing comparable sales? Let me share with you five principles to know about stemming from the Fannie Mae Seller’s Guide (pages 597-598). This can help you understand some of the guidelines appraisers use when choosing comps, as well as give you some direction in case you are planning to share sales sales data (comps) with the appraiser during the inspection. Bare Minimum: Appraisers must use at least 3 closed sales as comps. One Year: Comps need to have sold within the past 12 months, though an appraiser can make an exception if there is a good reason to use older sales (custom home, no truly recent competitive sales, etc…). Subject as Comp Four: The subject property can be used as a 4th comp if it sold recently. This might seem strange, but I’ve done this before when sales were extremely limited. No 90-day Rule: Appraisers do not have to use sales in the past 90 days. If there are better comparable sales (but older), the appraiser can certainly use those instead of using less similar newer ones. In fact, when speaking of comp selection, Fannie Mae gives the following example: “It may be appropriate for the appraiser to use a nine month old sale with a time adjustment rather than a one month old sale that requires multiple adjustments.” Of course many lenders do have a 90-day comp guideline, which makes it seem like appraisers need to use this guideline, but it’s really not a Fannie Mae rule. No One-Mile Radius: There is no such thing as a one-mile radius from Fannie Mae. Many lenders want appraisers to stay within a one-mile radius for comps in a suburban area, but that is NOT a Fannie Mae requirement. Appraisers should use the most competitive sales available. Bottom line. The question then becomes, “how far should an appraiser go for comps?”, but the better question is, “where should an appraiser go for comps?” Sometimes tracking down the best available comparisons means staying within a few streets, while other times it might mean traveling multiple miles away. A one-mile radius can actually be a dangerous way to search for comparable sales anyway because you could easily have many different markets within one mile (this is why I use the polygon search in MLS). When appraisers or real estate agents use the wrong sales for comparison, it’s easy to have an off-base value or price. If you want to gauge comparability, ask yourself the following: Would a buyer likely purchase this “comp” if the subject property was not available? Is this “comp” located in the same neighborhood or a truly competitive neighborhood? Do you think other people in the market would consider your sales as comparable to the subject property? Private appraisals may be different: Fannie Mae and lender rules do not apply to private appraisals for divorce, estate planning, tax grievances, pre-listing, etc… Some of the guidelines are reasonable of course in that appraisers ought to use the best sales available, but otherwise appraisers do not wear the lender’s leash for private appraisal work. For instance, I had over a dozen divorce appraisals last month, and my reports didn’t have to explain to a lender why some sales were outside of a 90-day time period. I simply used the best sales to help illustrate the market. Bottom line.